(Un) Civil Society and Political Change in Indonesia provides critical analysis of Indonesia’s civil society and its impact on the country’s democratization efforts that does not only take the classical, pro-democratic actors of civil society into account but also portrays uncivil groups and their growing influence on political processes. 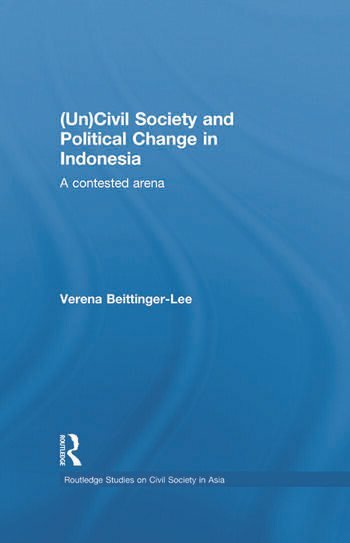 Beittinger-Lee offers a revised categorization of civil society, including a model to define the sphere of ‘uncivil society’ more closely and to identify several subcategories of uncivil society. This is the first book to portrays various uncivil groups in Indonesia, ranging from vigilantes, militias, paramilitaries, youth groups, civil security task forces and militant Islamic (and other religious) groups, ethnonationalist groups to terrorist organizations and groups belonging to organized crime. Moreover, it provides the reader with an overview of Indonesia’s history, its political developments after the democratic opening, main improvements under the various presidents since Suharto’s fall, constitutional amendments and key reforms in human rights legislation. This book will be of interest to upper level undergraduates, postgraduates and academics in political science and Southeast Asian studies. Verena Beittinger-Lee obtained her phd from the Department of Southeast Asian Studies at the Alexander von Humboldt University in Berlin in 2007 and now works at a law firm in New York.